Winter was mild and dry. Spring too was characterized by a low rainfall. 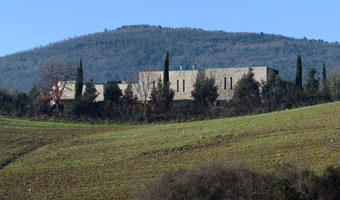 The vines sprouted slightly sooner than usual but growth was regular and healthy. A very hot summer led to an earlier veraison and harvest. We started with the Cabernet Franc at the beginning of September and concluded with the Petit Verdot on the 20th of the month. A severe selection was applied both in the field and on the sorting tables leading to a very low yield per hectare. 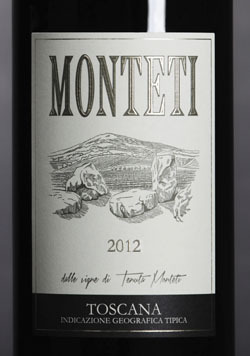 Of a deep ruby red, Monteti 2012 emanates notes of mediterranean woodland, blackberry, leather, rose and graphite. Full bodied and enveloping, a very fine tannic structure leads to a long-lasting finale. VARIETIES: 55% Petit Verdot, 25% Cabernet Sauvignon, 20% Cabernet Franc. VINIFICATION: temperature-controlled spontaneous fermentation with indigenous yeasts. The vinification of the grapes from the various plots of our vineyards takes place separately in open tapered steel vats. Each plot is kept classified separately also along all the wood ageing process, up to the moment of the blend composition. MACERATION: up to 21 days depending on the variety. Long contact with lees to drastically reduce the use of sulphites. MATURING: 18 months in medium-toasted French oak barriques (70% new and 30% of second passage). This is followed by further 24 months of bottle ageing. No fining or filtering.